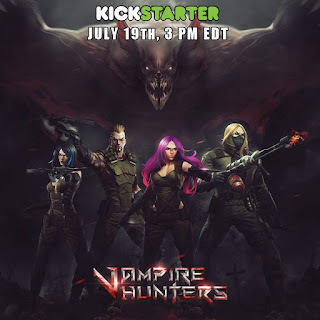 Dark Gate Games is pleased to announce the upcoming launch of their Kickstarter campaign for Vampire Hunters. Vampire Hunters is a fully co-operative miniatures-based board game for 1-4 players. Bring the dark imagery of Vampire lore from the classic stories in movies and books to your table top, as you take on the role of a newly recruited Vampire Hunter. Thrown into the Vampire den with a small band of comrades, you use stakes, crossbows and holy water to destroy the creatures of the Night. Craft makeshift weapons on the fly for more destructive power! Tear down window coverings to burn Vampires with Sunlight! Drag screaming Vampires outside the den with the Extractor! Team up to make combination attacks! Stay focused on your mission to power special abilities! Optional game modes add to replayability. Play standalone games or follow the full campaign, upgrade your weapons, equipment and special skills as you advance in the Order. Play semi-coop to rate your skills, giving bragging rights to the best Hunter. You can even play on as a Vampire, if your Hunter gets turned. Make Vampire Hunters the experience you want it to be! Vampire Hunters will feature highly detailed plastic miniatures, beautiful double-sided map tiles, 300 tokens, cards and dice, as well as full color scenario and rule books. Visit us on our BGG page, Facebook and Twitter for more information about Vampire Hunters. Damn, 'slayer' early bird pledges disappeared faster than I could pledge. Hope it stays "live" and doesn't get canceled again. Too bad about there being early bird pledges. I had backed the first run, won't be doing it this time around.